“Karl Muck was born in Darmstadt, Germany, on 22 October, 1859. While in Leipzig he attended the conservatory where he studied piano, and eventually made his début at the Leipzig Gewandhaus in the Scharwenka Piano Concerto in b-flat minor in 1880. Choosing not to pursue a career as a pianist, he instead accepted a position as chorus master of the Zürich municipal opera - one of the traditional stepping stones for a young conductor; he was soon offered a post as conductor there. 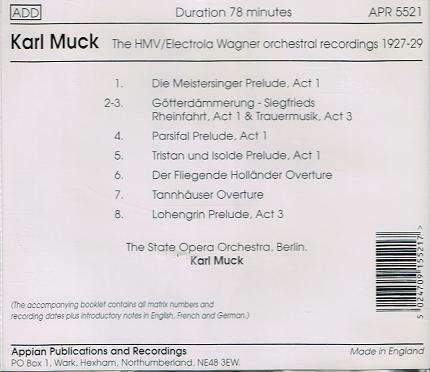 Muck moved on to more important positions as a theater conductor in Salzburg, then Brno and Graz; while in the latter position a traveling opera impresario hired him for the Landestheater in Prague in 1886, as well as for his traveling Wagner company. 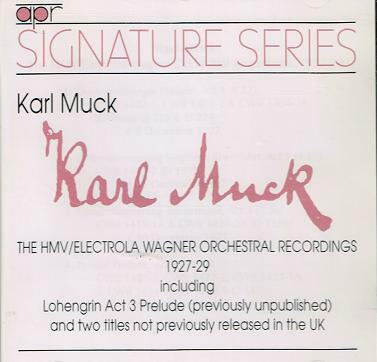 Muck gained a reputation as natural leader, able to impose his discipline on an orchestra quickly and achieve intelligent, tasteful, and highly musical performances. His performances had a sense of authority and security, as well as warmth and logical structure. By the age of 30, in 1889, he conducted a complete Wagner RING cycle in St. Petersburg and, two years later, in Moscow. In 1892, he was appointed first conductor of the Berlin Royal Opera, and appointed general music director in 1908. Meanwhile, from 1894 to 1911 he appeared every year as a guest conductor in the Silesian Music Festival in Görlitz. He was selected to conduct PARSIFAL at the 1901 Bayreuth Festival, and appeared there regularly thereafter until 1930. Before his 1908 appointment in Berlin, he was also a regular conductor of the Vienna Philharmonic (1904 - 1906) and the Boston Symphony Orchestra (1906 - 1908). 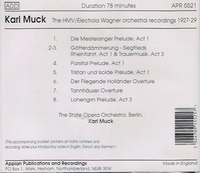 Muck returned to the United States to become conductor of the Boston Symphony Orchestra in 1914, with remarkable success that continued until the United States entered World War I in 1917, making the conductor an enemy alien. A patriotic German, Muck did not temper his expressions of support for Kaiser Wilhelm II during the war. Also, his refusal to conduct the Star-Spangled Banner (traditional during the war), as well as his outspoken resistance to the wartime ban on German music (including that of Beethoven), made him the target of public outrage. These pressures, combined with those incurred through an illicit and very public romantic affair, proved too much for the board of the Boston Symphony, who terminated his position. Threatened with prosecution under a federal morals law called the ‘Mann Act’, Muck agreed to be arrested at his home on 25 March, 1918, as an enemy alien and was interned as such until the end of the war. The shameful episode ended with the war and in 1919, he returned to Germany where he obtained a position conducting the Hamburg Philharmonic from 1922 to 1933; this was his last post before retiring at the age of 74. He died in Stuttgart on 3 March, 1940.